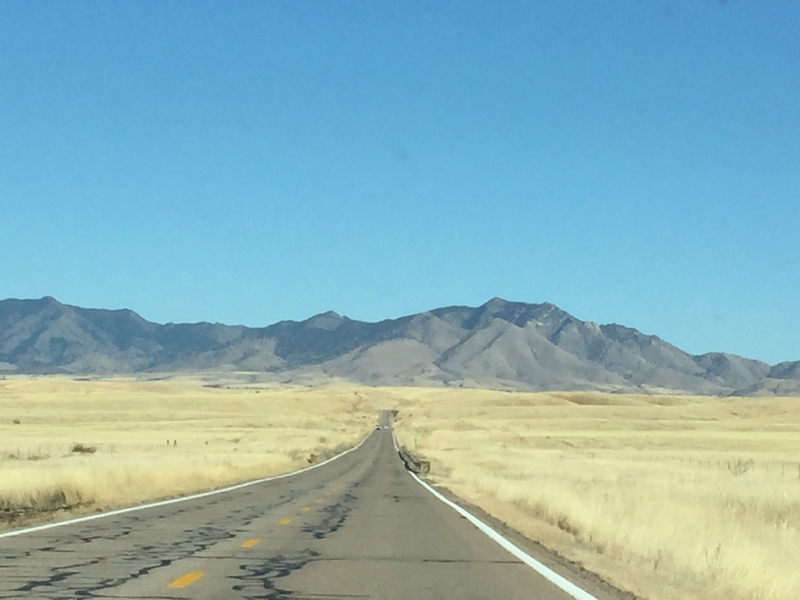 Jay and I had an action-packed day of curated winery visits the next day around Sonoita. We began at 9:30 a.m. At Dos Cabezas Vineyards. Winemaker Todd Bostock worked quickly, taking us through the line-up of current releases but also pulling some barrel and concrete tank samples too. 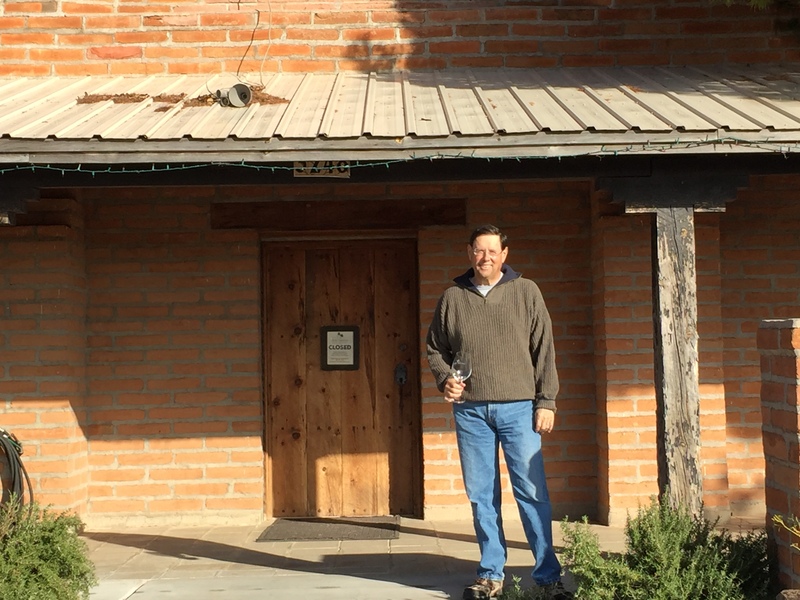 Arizona wine author Jay Bileti in front of Dos Cabezas winery, Sonoita. I can tell a lot about what to expect from a tasting by listening to winemakers talk about winemaking in general. 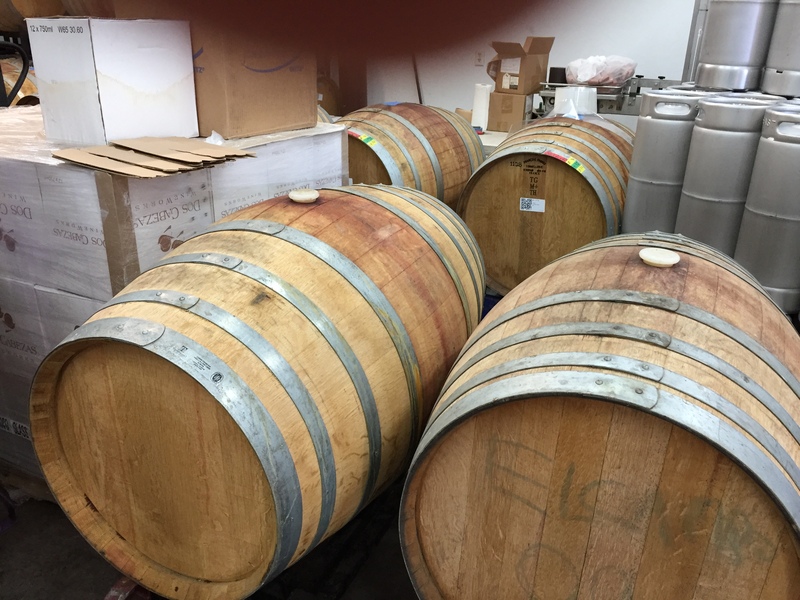 Todd had recently returned from a trip to Slovenia and Sicily to taste wines there to consider planting, but he spoke mostly about his alternative fermentation and aging vessels; two 2,000 gallon fudres and many 80 gallon puncheons to decrease the surface area of oak to volume ratio of aging red. He also uses two 2,000 gallon concrete fermenters. With the first taste of his complex but elegant *“Meskeoli” 2015, I knew we had started on the right foot. This wine was a blend of picpoul, Viognier, Riesling, Marianne, and Albariño, a hard act to pull off and make you believe it, but he did. The nose started off light, with lime and mineral notes, followed by lovely floral and apricot notes from the Viognier. On the palate, the wine is lively and medium-bodied, drinking much like Petit Manseng, with bright tropical fruit and excellent fruit/acid balance. For those who prefer a richer style, the *El Campo Blanco 2016 is about as elegant as you can get with a French oak-fermented white blend. Using the three Rhone grapes Picpoul, Rousanne and Viognier, this blend has a nose showing restrained new French oak with Viognier floral notes and fruit balancing it nicely. On the palate, the wine is like the Meskeoli but richer, denser and more complex, with bright tropical fruit notes balanced by lees, oak and acidity, very stylish. The simply named *Pink 2016 is a GSM blend that also includes Picpoul. Color, flavor and crisp palate very much in a Provençal style, this elegant rosé starts slowly, with delicate pink cherry notes on the nose, then follows with like flavors and very refreshing but smooth acidity. This is Dos Cabezas’ largest volume label and with the hot summer weather, it’s clear to see why it’s so popular. For the red wines, Todd makes eclectic blends such as the Toscano, with Sangiovese, the two Cabernets, Petit Verdot and Aglianico, but just as much of an influence is his use of large vessels to impart less direct oak influence and flavor on the wines. 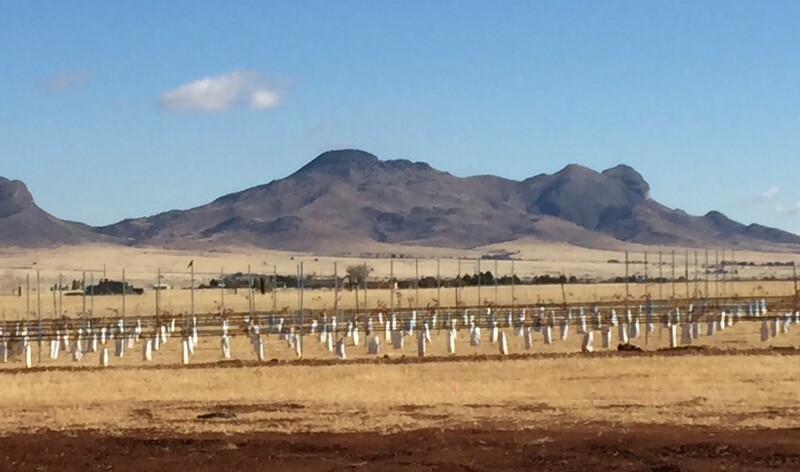 For example, his El Norte uses Grenache, Syrah, Mourvedre and Graciano, co-fermented in 1,000 gallon concrete tanks. *Cabernet Franc 2016 (barrel sample): aging in a heavy toast cigar-shaped barrel for maximal lees contact. Nose: classic graphite/pencil-lead minerality, then firm black cherry flavors balanced by lees contact. Very varietally correct and shows the potential for this grape here, as it has shown well in Colorado. Promising and stylish for a barrel sample. * El Norte 2013 (mostly Grenache). Nose: delicate, fine-scented floral and dried cherry notes. Palate: wow! Rich and full-bodied but great raspberry fruit. Fine fruit/acid balance but great varietal typicity in an elegant way (no alcohol burn). 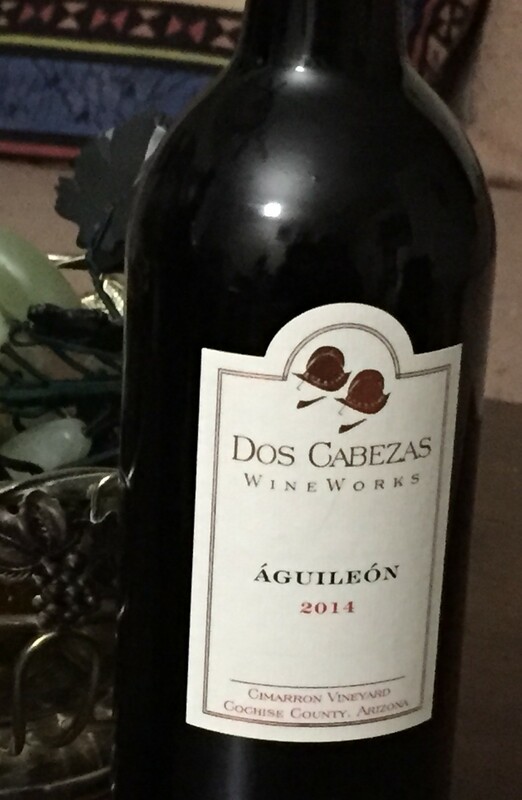 *Aguilion 2014: 77% Tempranillo, 23% Graciano. Nose: lovely fruit and spice notes, actually driven more by Graciano. Palate: ripe spicy black fruit-driven with fine, silky tannins. An impressive New World interpretation of these two Rioja grapes. **La Montaña 2014 (Petite Sirah, Syrah and Petit Verdot). Nose: wow! Rich dark fruits plus tobacco and clean earth. Palate: also wow! Huge black fruits, spice, earth and tobacco. A large wine for brisket barbecue or a cold winter’s night. 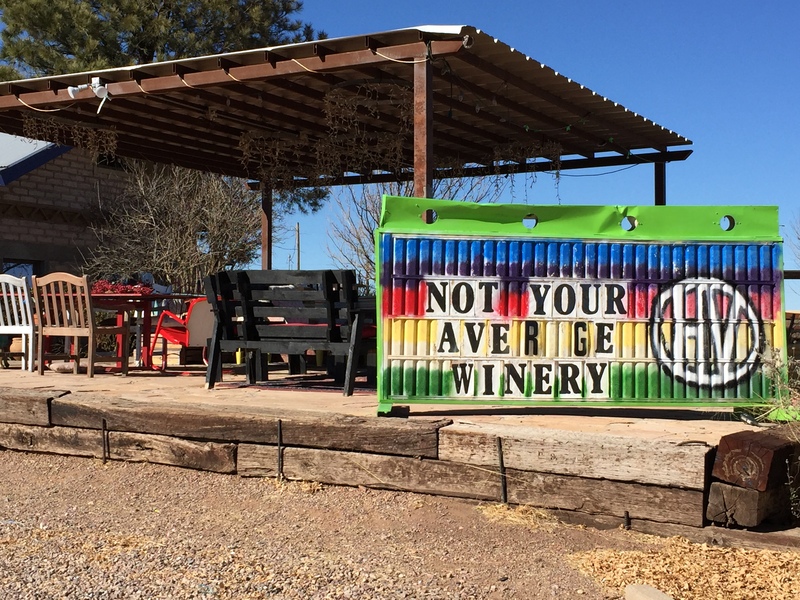 Next we drove to Deep Sky Vineyard tasting room (vineyards in Willcox), whose owners went to Argentina on vacation and decided to buy a malbec vineyard there. 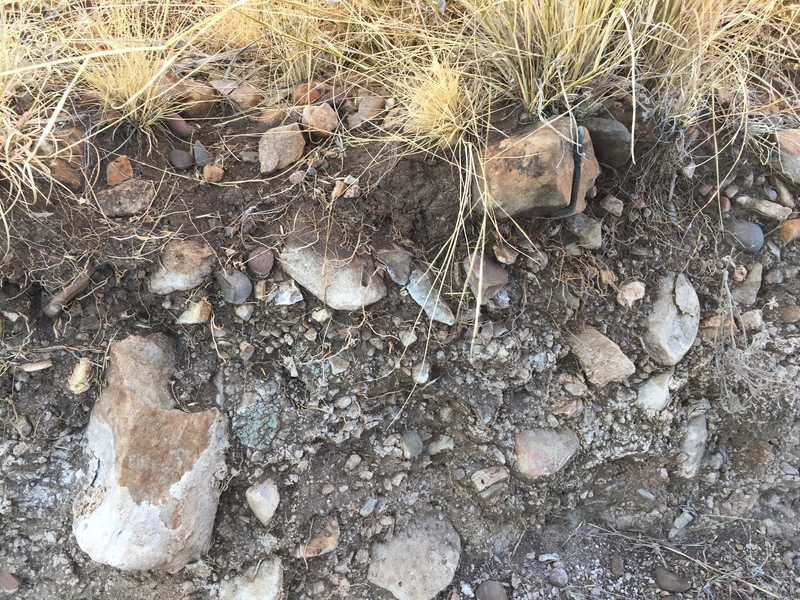 When they started looking at the similarities between the Mendoza region and Willcox, they decided to plant Malbec and Rhone varieties. 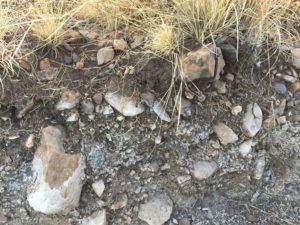 Like some other area wineries, they have the terra rossa soil, of clay over limestone that classifies the Coonawarra district of South Australia, famous for its Cabernet Sauvignon. Jay had hoped we could try some of their malbec wines, but only whites and light reds were available that day. However, from what we tasted I was convinced that owners Kim and Phil were on the right track. *Orbit 2013 (Syrah/Grenache 50/50). Nose: lovely varietal blend in a fresh Rhone style. Palate: wow! Juicy, big and fresh but low tannins. Excellent fruit/acid balance and true varietal character. *Eclipse 2015 (80% Malbec, 20% Grenache): the nose is floral, fragrant and fresh. Palate: wow! Blueberry, red cherry, fragrant and floral, wonderfully fragrant and fresh. 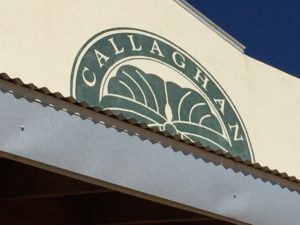 Our next stop was Callaghan Vineyards. Owner/winemaker Kent Callaghan is a widely respected winemaker in the local industry. White Blend 2013 (Roussane, Viognier, Malvasia): assertively fruity, from Viognier and Malvasia. On the palate, floral, fruity but dry and refreshing. Very Alsatian in style with elegant, dry fruit. Malvasia 2015: Nose: light, bright lemon and floral notes. Palate: very vibrant, with dry lemon flavors balanced with some oak. Fresh and bright but the oak softens the natural acidity. Stylish and shows the potential for this grape in a dry style in this terroir. 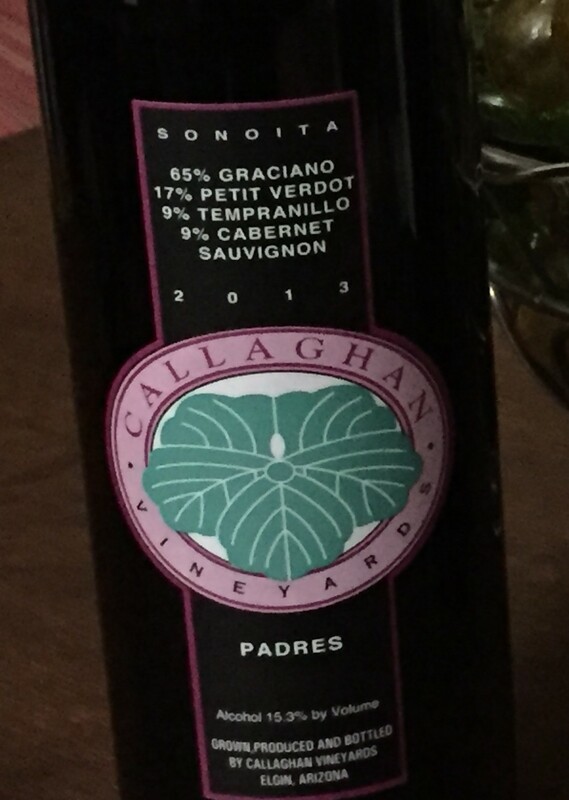 **Padres 2013 (65% Graciano, 35% Petit Verdot) Nose: Spanish-like black fruits and spice (50% new oak). Palate: big tannins and spice, pepper and dense black fruits. Needs time but will improve; an original interpretation of these two grapes. 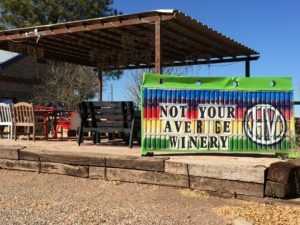 Arizona Hops and Vines planned to be the first winery/brewery in AZ, in fact once they realized their business plan violated state law, they had to have a lobbyist friend help change the state law (they still don’t have the brewery up and running). Basically this operation run by two sisters who work on it constantly is an imaginative adult Disney Land, with fun and games for both genders involving alcoholic beverages. Sparkles Brut 2014: made from the humble French Colombard (a k a Ugni Blanc), this refreshing sparkling wine was much better than table versions I’ve had from California. On the nose, it was fruity and zesty; on the palate, it had varietal flavor but instead of being flat and heavy as with table wines, it was fresh, lively and dry. *Sauvignon Blanc 2013: Nose, tropical fruit and some oak. Palate: zesty passion fruit and lively acidity; shows this grape has potential here. *Sauvignon Blanc 2014: Nose: a fun Loire-style nose with passion fruit and flinty minerality. On the palate, same as the nose; zesty, fresh and lively. *MeCaSah 2013: The nose shows great Rhone and Bordeaux aromas of dark fruits and smoky cherry. On the palate, big Syrah and Bordeaux flavors. Huge fresh fruit on nose and palate, lots of potential for aging. Rune Vineyards brands itself as being “off the grid”, and also they only have wild yeast fermentations. Viognier 2015: a blend of lots fermented in stainless steel and neutral French oak. Nose: lovely floral, fragrant notes of peach and some tropical fruit. Palate: floral, with tangerine and tropical fruits. Wonderful varietal typicity but good fruit/acid balance. √ Roussane 2016: Nose is spicy and aromatic. Palate: a whole package of aromatics and pear flavor, viscocity and acidity on the finish. Outstanding varietal character. √Grenache 2015: Nose of fresh, bright raspberry with some white pepper. Palate: Bright, fresh, fleshy texture, clean finish. Stylish in a New World way, fresh and bright. *Syrah “Wild”2015: Co-fermented with some Roussane and Malvaxia. Nose: lots of cherry. Palate: juicy, bright cherry, but needs more time. √Vermentino 2016: Nose is light and lemony with hints of pear. On the palate, dry with some mid-palate density, delicate pear notes, fresh but the density on the mid-palate makes it richer than an ordinary pinot grigio. Good varietal typicity, another good white candidate for this region. 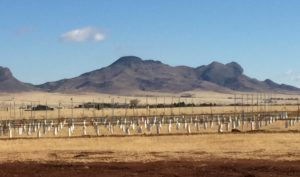 Summary: The high grassland desert of southeast Arizona is a very favorable area for growing high-quality Mediterranean grapes. The wineries here are making thoughtful, original blends that defy the Old World country-limited blends, mixing Bordeaux, Rhone, Spanish and Italian varieties to make high-quality and possibly unique wines I haven’t encountered yet either in the Old World or the New World. I believe there is a specific terroir for the Willcox and Sonoita AVAs of Arizona. Despite the desert environment, there is significant diurnal variation of temperature and with (normally) low humidity, this means very good malic acid retention making for ripe wines with lots of pure, fresh natural fruit with refreshing (natural) acidity, with a vibrancy that brings fruit and acid together in a pleasing , balanced forte on the finish. I found this combination across the two regions and many varietals and blends. 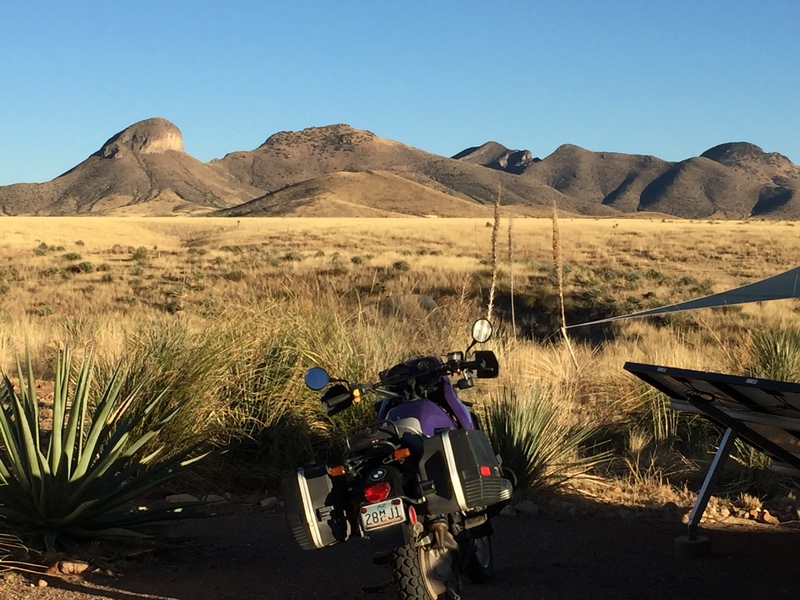 There are some challenges, like the region’s late summer monsoons. Thin-skinned and tight-cluster varieties therefore are not sustainable here, but most producers understand this. Interestingly, Todd at Dos Cabezos Vineyards says Virginia grows many of the same grapes that perform well in Arizona. While this is true for Viognier, Tannat, Roussane and Petit Verdot, it’s not true for Tempranillo, Graciano and other thin-skinned and tight-clustered grapes that don’t translate to the humid East of Virginia. 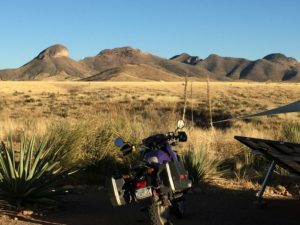 That said, the terroir of southeast Arizona, the selection of grape varieties and the brilliant blends I tasted convince me that the region could get a reputation as one of the hottest new emerging wine regions in the country. Thanks to Jay Bileti and all the wineries who accommodated us and waived tasting fees for this research.